There are 11 images tagged with “reflections”. 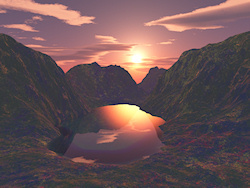 I created this high mountain lake scene in Terragen. The software didn&apos;t allow for any objects including plants, only the landscape, water, and atmosphere. But by giving the ground variegated colors I was able to get the impression of wildflowers growing by the water.